Are you looking to build killer back muscles that support you while lifting and improve your appearance as well? The lat pulldown machine is probably the best option in fitness equipment to build your back muscles. These popular machines are found in any self-respecting gym and are the perfect addition to any home gym. However, purchasing any fitness equipment, including the lat pulldown machine, can be intimidating. How will you know you’re making the right choice? This exclusive guide will walk you through everything you need to know about lat pulldown machines. We’ll clear away the mystery and explain how the lat machine works, which models are the best and how you can take advantage of your lat machine to achieve the best fitness results. 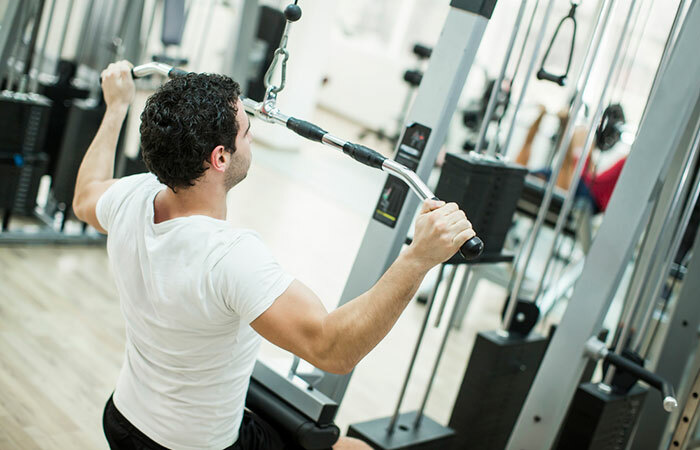 What is a Lat Pull Down Machine? 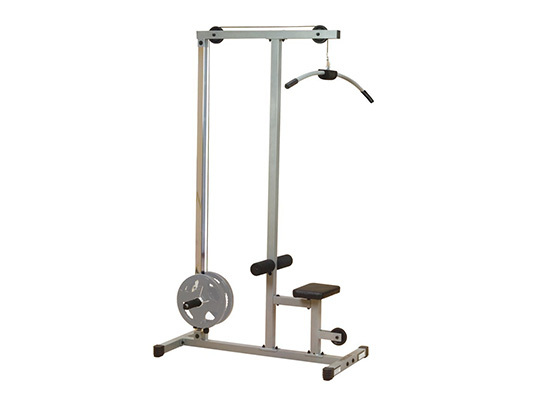 The lat pulldown machine is an essential piece of gym equipment found in any self-respecting weights area. Also known as the cable pulldown machine, it consists of a bench and a set of weights in front of you that are operated with a pulley system. There’s a pulldown bar above your head that can be reached when you’re standing. Typically, the pulldown bar offers a few hold points so that you can target different muscles depending on where you grab the bar. The machine is simple and easy to use. But, don’t let it fool you. It’s fundamental in any complete gym routine and one you should definitely consider adding to your own home gym equipment. What Muscles does the Lat Machine Work? The lat pulldown machine is designed to work the Latissimus Dorsi, which is the full name of the muscle most people call their “lats”. Where are these muscles? Your lats are in your mid-back (one on each side) and expand out from your spinal cord in a triangular shape. 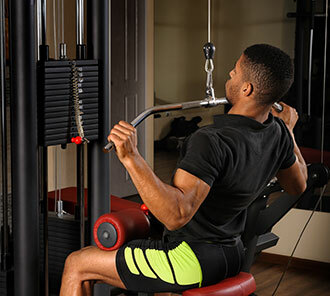 The lat pulldown machine also targets the rhomboids, serratus anterior and lower and middle trapezius. These are muscles in your upper back and shoulder blades. As you can see, the lat pulldown machine works quite a few of the muscle groups in your back. Why Use the Lat Pull Machine? The lat machine is important for most people who work out because the alternative is to do pull ups. Not everyone has the strength and technique to be able to jump in and do pull ups. In addition, once you can pull more than your own body weight, a lat pulldown machine can help you continue to advance. Other advantages include that you can perform drop sets without the nuisance of using a weight belt or something similar if doing pull ups. Working your lats can also help you reach your goals in terms of physical appearance. For men especially, having nice wide lats can help create that “v-taper” or triangle look of wide shoulders and a thin waist. The lat machine will help you achieve this elusive look by broadening your back muscles. Just make sure you get a protein-rich diet for muscle-building and round out your workouts with other exercises for best results! Are you ready to purchase your own lat pulldown machine? Always having to head to the gym can be a drag. If you’re working on building up your home gym equipment, a lat machine is an obvious piece of equipment to add. But, there are many different lat pulldown machine options including versatile home gym machines. How will you decide which to buy? We’ve picked through the many choices to highlight a select few that offer the best value for money. This home gym includes a range of weight exercises including the lat pulldown. If you’re interested in performing a range of both arm and leg workouts, the Steel Home Gym by Marcy is a great choice to consider. This workout equipment comes highly recommended because it offers great value for money and excellent reviews. Marcy is a brand owned by IMPEX, a large fitness equipment and product manufacturer. Since 1982, the company has operated and now owns a number of well-known brands such as Apex, Hers and Competitor. The company is well-established in the industry as a leader and innovator. Marcy offers a wide range of home fitness equipment available for sale on Amazon and at retailers such as Walmart. While some reviewers note that they are a bit too tall to get full extension on the lat pulldown, the machine does offer great versatility. With a bit of bench adjustment, you should be able to make the lat position work for you. But, this home gym works for much more than just your lat pulldown. Based on the great reviews, reasonable price and reliable brand, it’s a great buy! This lat pulldown machine is another winner. Featuring a great pulley system, this machine is also versatile and allows users to do many different exercises. If you like rowing, this machine offers a few great options for this exercise. With great reviews and a very reasonable price, this lat machine is the perfect addition to a home gym. Valor Fitness is a big name in weight lifting equipment. A family run business begun in 2006, Valor Fitness has quickly become a popular brand, selling with well-known retailers such as Walmart in addition to their online sales through their website. 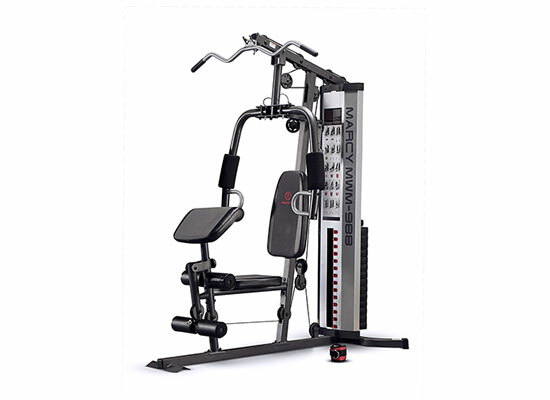 A reputable brand, great price and excellent reviews make this lat pulldown machine a top choice. All you need to add to the machine are your own weight plates which can also easily be purchased from Valor Fitness. This machine offers great value for money and is a great addition to any home gym, especially if you’re looking for adding a variety of exercises. This lat machine is another versatile machine offering a range of exercises such as rowing and the tricep pulldown. The excellent customer reviews and versatility of the machine makes it a great choice. However, the drawback mentioned by some users is that the pulldown bar falls behind the bench. This design requires users to lean back far to perform the lat pulldown. The Valor model avoids this issue by running the rowing component along the backside of the machine instead. Otherwise, the Akonza model is a simple, attractive machine. You must use your own set of plate weights in order to perform the exercises. Akonza is a company that makes home fitness equipment. While there isn’t a lot of information available about the company, their products are sold at many major retailers such as Sears, KMart and Walmart. While it may not be a first choice for lat machine due to the design issue, it’s a great option for a reasonable cost. It allows users to perform several different types of exercises and is made by a reputable company. Given the positive reviews, it’s a good choice for most home gym users. However, if you’re really set on performing your lat pulldowns correctly, you may consider another model to ensure that you won’t have to lean back too far due to the design. This versatile lat pulldown machine also allows for other exercises to be performed such as seated rows and tricep press down. However, unlike the other models, you have to adjust the pulleys yourself each time to switch between rowing and lat pulldowns. Customers agree that it’s a great machine, but do note that assembly is a bit challenging. You’ll have to add your own weight plates when using the machine. Overall, for the price, it’s a good choice. Powerline is a popular fitness equipment company that sells products online and in retail stores such as Sears. Overall, the reviews for their products are very positive. The brand is sold under the company Body Solid, based outside of Chicago in the USA. 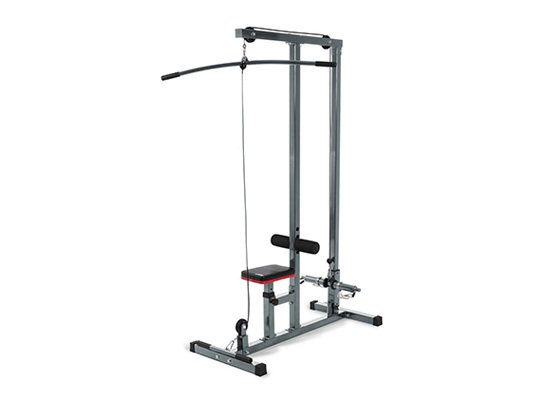 Powerline’s lat pulldown machine is reasonably priced and has the backing of a reputable company. The positive reviews and simple design are advantages. However, for a similar price, you can get a machine with a double pulley machine such as the Valor model, meaning you wouldn’t have to fiddle with the cables as much to change exercise types. How do you make your final decision? Ultimately, it depends on what your needs are. But, here are some pointers to helping you make sure you’re completely satisfied with your purchase. Know Your Goals: If you want a lat pulldown machine that’s exclusively focused on this exercise, don’t bother looking at the home gym options with lots of other options. But, if you’d rather invest in a piece of equipment that will allow you to do many different exercises, opt for those machines. Knowing your goals will help you decide which machine is best. Check Design for Flaws: The Akonza model’s design flaw makes users lean back when performing the pulldowns, which isn’t good form. So, make sure that you choose a machine that allows you to perform the exercise with great form. The pulldown bar should be easily reached just ahead and above you when you sit on the bench. You should also be able to adjust the bench for the proper height. Read Reviews: Let’s face it, sometimes the best way to find out if fitness equipment is a treasure or a piece of junk is through reviews. Real users will give an honest review of the product and let you know how well it really worked. Although you’ll naturally find a few bad reviews on any product, if they make up more than 20% of the reviews, you’ll know to avoid the product. Know Your Budget: Usually a bigger budget can buy a better lat pulldown machine, but only you know your personal finances. It’s best to buy within your means. Look for products that meet your quality and budget needs. Now that you know what lateral pulldown machines are available on the market for a home gym environment, it’s time to make sure you know how to do the exercise. As with any machine or exercise, performing the exercise the correct way is essential. Your form and following best practices will ensure that you target your muscles correctly and avoid injury. Sit on the bench. Your knees should fit snugly under the knee rest with little wriggle room. Adjust the height of the bench for the best fit. Sit up straight. Extend your arms, grab the bar and ensure an even grip on either side of the bar. 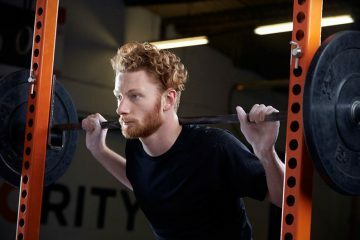 Pull the bar straight down, keeping your elbows pointing down. Pull to just below your chin, your elbows shouldn’t go past your back. Concentrate on the muscles in your back and squeeze them as you pull. Raise the bar again until your arms are fully extended. Repeat for as many repetitions and sets as you’d like. Adjust your grip to use the wide grips and straight grip on the bar. This will target different muscle groups in your back. Leaning back in excess. Leaning way back means you’ll miss the point of the exercise, as the muscles you’re hoping to target won’t be engaged. Don’t pull the bar behind your neck. This can result in a shoulder injury. In your regular life, you’d never make this movement, so it is really quite unnatural. Instead, stick to pulling the bar down to just below your chin. Avoid pulling the bar down too far. When you pull the bar down to your belly button, it can put unnecessary stress on your shoulder muscles. Don’t take a grip that’s too wide. The bar is long to accommodate the different sizes of people who may use the equipment. Using both a wide grip and a narrow grip can help you take advantage of the exercise and get more out of your workout. So, how wide should you make your grip? Go about 3-5 inches wider than your shoulders. The narrow grip should put your hands about 6-12 inches apart. Don’t use momentum, swing or rock when performing the exercise. If you can’t comfortably pull the bar down without rocking, reduce the weight. Don’t release the bar too quickly on the way back up and never come up off the seat. The whole exercise should be completely controlled. Exercise physiologist Clinton Maclin recommends carefully choosing the amount of weight you put on the machine. You should be able to successfully complete 8-10 repetitions with great form. If you can’t manage, reduce your weight and try again. Remember, you’re not doing yourself any favors by completing a bunch of reps if your form is off. Instead of strengthening your muscles, you’ll end up with injuries. The good news is that when you do perform the exercise correctly, you can strengthen your back quite a bit! As long as you’re patient and work on your form, you’ll slowly increase your strength and it will start to show. Getting your own lat pulldown machine is a great way to move forward with your fitness goals. Make sure you do your research ahead of time and consider your options before you make your final decision. The machines listed in this post are all solid options to choose. Then, once you have your home lat pulldown machine set up you can get to work on reaching your back strengthening goals! As you can see through the reviews, most machines also allow you to work in some rowing and tricep exercises, meaning you’ll get great returns on your investment. 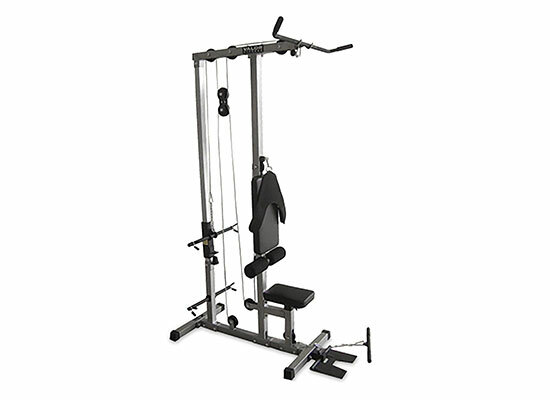 Do you have a favorite lat pulldown machine? Tell us about it in the comments below! I have a question as regard this. Does lat machine usage has effect on backbone? I observed the last time I used, I experienced pain at my back. Please, I’m waiting for your honest reply. This August we’ll move into my dream house and we’ve decided to use the basement as a home gym. I can’t invest that much right now so I’m focused on buying equipment that can be used to train more muscle groups. I have a problem with my lower back and my doctor recommended to be as active as possible as I have a desk job so I don’t move around that much. Declined pushups, elevated lunge, cable crunch, there are a lot of exercises I can do on this machine. The one from Marcy seems to be a great choice; it seems way sturdier than the other ones. Yes, the lat machine is designed to work your back muscles. 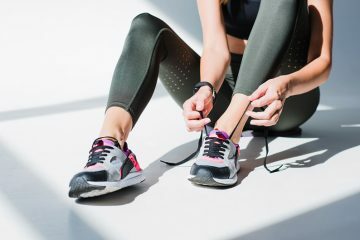 While your actual bone shouldn’t hurt, your muscles surrounding it may get a bit sore if you really work it. I would recommend you ask a trainer to check your form to make sure that you’re performing the exercise correctly to avoid any injuries or excessive soreness. Good luck! The Marcy system looks quite ok and it’s decently priced, quite surprisingly. I have a weight bench, a squat rack and a cheap leg press machine but I want to buy more equipment. It takes a lot of space but it’s so much better for me than going to the gym. 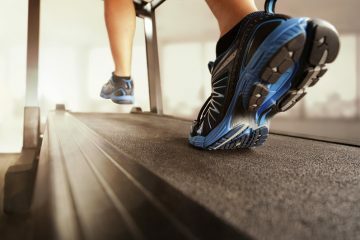 I usually wake up, have my coffee and then jump on the treadmill for 10-20 minutes to warm up. Well, it took me 30 minutes just to walk to the gym so yeah, it’s a big time saver for me.